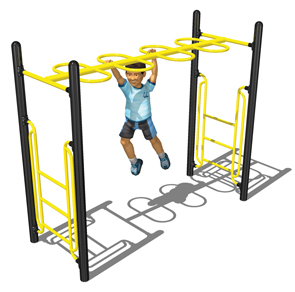 Watch kids improve their upper body strength on the Loop Rung Horizontal Ladder. Three-rung ladders on either side make starting and dismounting easy without the need to jump off at the end. Manufactured for commercial use and tested in accordance with ASTM standards. This horizontal ladder playground structure is powder-coated with a 5-7 mills thick, triple flo-coated corrosion protection for a superior, high gloss, no peel, no flake finish baked-on at 400°F and resistant to salt spray, humidity, solvents, oils, acids, and alkalies.